Creative spoke covers for Dewi’s dreams! Just over three years ago now Dewi had SDR (selective dorsal rhizotomy). A procedure that cuts nerves in the lower back to reduce spasticity in children (and adults) that have cerebral palsy, reducing stiffness and pain, improving mobility and in most cases enabling children to take their first steps. 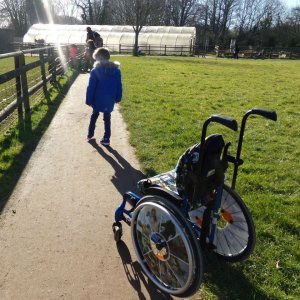 When Dewi was just two years old he was given his first wheelchair. Being the observant little boy he is he began to ask why people were looking at him. Dewi’s dad Robert, wanted to create some designs for his wheelchair wheels which would bring him some positive attention, so putting his IT teacher graphic design skills to the test he came up with ‘RJSpoke Covers’ to create bespoke deigns that Dewi would love for his wheelchair wheels. “He began to be conscious that in some cases people were looking at him in a negative sense. 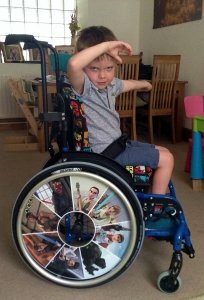 We were aware that some people had designs on their wheelchair wheels but we knew from what we had seen Dewi wouldn’t like them and we wanted something that would bring him positive attention.” Explained Robert. After enquiring with his local printers who deemed it possible, Robert got designing. Robert old us “At the time Dewi, was really into the Avengers and Hulk in particular so I made a ‘Hulk Smash’ design. I got it printed and stuck on to the plastic spoke covers on his wheels which he loved. While we were in St Louis for Dewi to have his surgery lots of people around the hospital and the general community commented on how cool his wheels looked and asked where they could get them from. The same happened when we came back to the UK so I decided to setup a Facebook page so those families we had met could get in contact.” To date, Robert has made over 38 stickers and many families have come back for more. Dewi had SDR in November 2015 and has been having physiotherapy through the NHS, and also with SDR Progression in Newport which paid for the funds raised with Tree of Hope; enabling Dewi’s dreams of being able to run, cycle, jump, kick and climb begin to be fulfilled. A saying that is often murmured around the office here at Tree of Hope is that ‘fundraising is a marathon, not a sprint. Every campaign is different, and the way people do it is different too. “There isn’t a manual or guide to help you with what to do and how to do it. It felt like every avenue we tried to take we weren’t making much progress. Having Tree of Hope support our fundraising campaign and allowing us to use their registered charity number was one of the turning points“ Robert says. If you would like to see more of Robert, R J Spoke Covers work visit rjspokecovers.co.uk and to get in touch about your own designs send them a message on Facebook RJSpokeCovers. 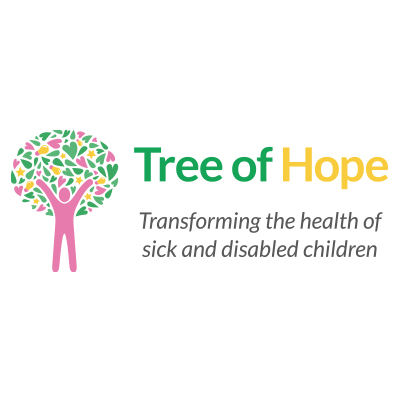 If you would like support from Tree of Hope in fundraising for your child’s medical care, please contact Georgie or Lee in our Family Support Team on 01892 535525 or via families@treeofhope.org.uk.